The phone doesn’t stop ringing at your rental location. Then where are all the reservations? Could it be that your associates aren’t maximizing the potential of this critical first encounter with a renter? 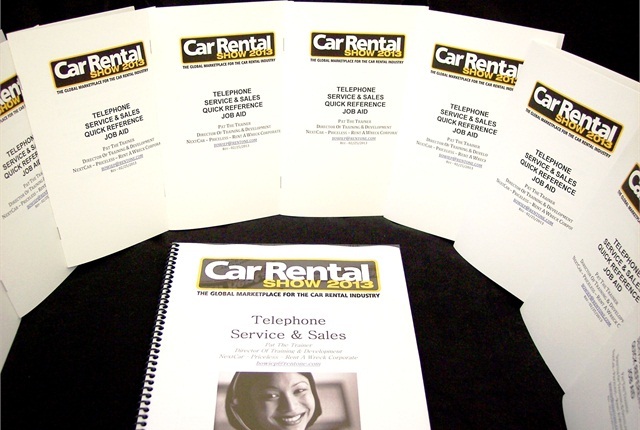 In the 2013 Car Rental Show seminar, “Turning the Phone Call into a Quality Reservation,” Pat The Trainer will give attendees the tools to turn telephone inquiries into more reservations, book higher time and mileage and increase booking ratios. All seminar attendees will receive a printed job aid (pictured) to support the session and to bring home and use in their operation. Pat The Trainer’s years of car rental training experience spans many different companies, from the majors to the independents. Today, Pat works for the NextCar, Priceless and Rent A Wreck Corp brands, with many fans. “Pat’s telephone service and sales sessions alone made it well worth my attending our annual convention,” said Marty Mehalko, a Rent-A-Wreck franchise owner in Dover, N.J. This seminar will held from 3:15 p.m. to 4:10 p.m. on Monday, April 15. The 2013 Car Rental Show takes place April 15-16, 2013 at the Rio All-Suite Hotel & Casino, Las Vegas. To see the full schedule and to register for the event, go to www.carrentalshow.com. All seminar attendees will receive this telephone sales and service reference guide to bring home and use in their operation.